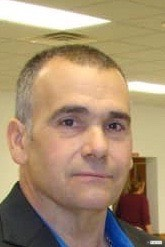 Dale M. Beers, 54, of Winchester and formerly of Rindge died on Thursday, March 14, 2019. He passed peacefully in the comfort of his home after a period of declining health with the love of family near. Dale was born the son of Catherine (Colt) and Charles Beers on December 13, 1964 in Groton, MA. He was educated locally and graduated from Monadnock Regional High School class of 1982. On January 9, 2019 he exchanged vows with Amber P. Miles in Winchester. They were married in a simple service with close family and friends in attendance. He worked as a towing manager at Gauthier Auto Services Inc. in Jaffrey for twenty-one years. In his free time he enjoyed; fishing, the outdoors and camping. He liked to be the grill master at family barbeques. Dale was always the jokester and was full of life. He loved being a parent to his girls and in time being a grandfather. Mr. Beers is survived by his wife, Amber P. Beers of Winchester. His parents, Charles and Catherine Beers of Winchendon, MA. His children; Laura J. Beers and her husband, John of Keene, Jessica L. Beers of Keene and Sherri L. Swords and her husband Timothy of Jaffrey. A daughter from a combined marriage, Sarah A. Kelly of Winchester. His siblings; Robert L. Beers and his wife, Van of Westford, MA. Gary A. Beers and his wife, Jacki of Rindge and Daniel C. Beers and his wife, Traci of Rindge. He is also survived by; his ex-wife Melissa A. Beers, twelve grandchildren, Aunts, uncles, cousins, nieces, nephews, extended family and friends.